Above: Paddington the Bear figures out how human things work in “Paddington.” Stock Photo. Many children see their teddy bears as their best friend and part of their family when they are young, but imagine if that teddy bear could walk and talk. The dream of a real life bear joining a family comes to the big screen with “Paddington,” the movie based off of the book series that started in 1958. Starting in the darkest parts of the Jungle in Peru, Paddington (voiced by Ben Whishaw) lives happily with his aunt and uncle (voiced by Imelda Staunton and Michael Gambon). Unfortunately, things go downhill fast with the beginning feeling as tragic as the start of a Disney film. Paddington soon travels to London in search of a family to live with and ends up running into the Browns. Although skeptical at first, the family decides to let him spend the night with him. 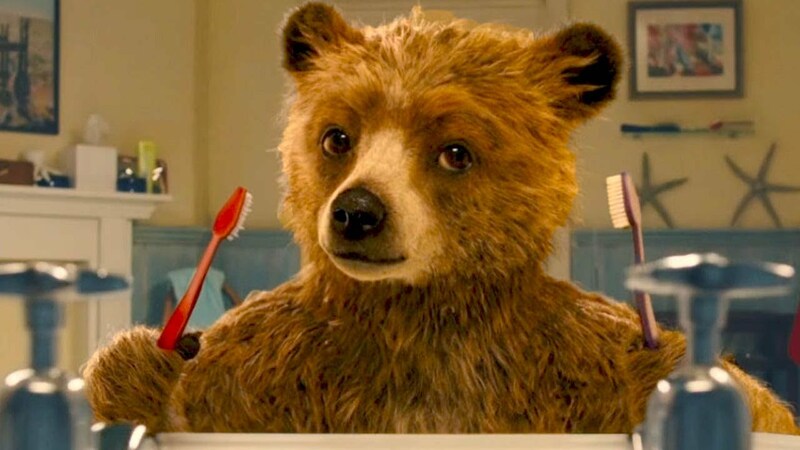 However, chaos soon ensues and Mr. Brown (Hugh Bonneville) demands that his wife (Sally Hawkins) takes the bear to the authorities immediately the next morning. Soft of heart, Mrs. Brown decides to help Paddington find the explorer that once visited his family in Peru. Unfortunately, another has heard of Paddington’s arrival. Millicent (Nicole Kidman), a taxidermist, hears of Paddington and thinks that he will be the perfect addition to her collection. So as the family is trying to help him find the explorer, while also realizing the love they have for him, Millicent is trying to hunt him down. Of course, action ensues as the film climax comes and all comes to an exciting end. The cast of the film shines brightly with some of the United Kingdom’s best and brightest actors taking both the lead and supporting roles. As the story of Paddington is one of the United Kingdom’s most beloved children’s stories, of course everyone wanted to be involved in the project. One of the best performances comes from Julie Walters, who plays Mrs. Bird, an older woman who lives with the Brown family. Walters takes on the quirky role with lots of spirit and fun. Towards the end of the film comes the best part of Walters’ performance as she enters a drinking match with a male security guard. Other actors that make short, but entertaining appearances throughout the film are Jim Broadbent, Matt Lucas and Doctor Who himself, Peter Capaldi. As one who never knew about Paddington or read the books, this movie was truly heartwarming and brought back a child’s spirit in me. Unlike most of the kids film trailers that come out today, this was one of the first that actually looked good and it definitely did not disappoint. For the parents who go to see the film, the plot line will be predictable and you’ll know it from the beginning. However, the relationship between Mr. and Mrs. Brown and their children is a cute one that strengthens throughout the film. It shows that sometimes you have to get out of your comfort zone to fully realize what is in front of you. Plus, your children will love the film, so why not take them? While “Paddington” already came to cinemas in November overseas, it will be in theaters this Friday, January 16th.